See also the Natural paint category. There are several eco-friendly paint options on the market, but many DIYers are choosing instead to make their own using natural materials. This page describes natural paints as a potential component of United States of America home construction. Only a few decades ago, the petrochemical industry largely took over the production of oil-based and water-based paints. The idea that paint should be able to breath was abandoned. Also, added synthetic chemicals are very harmful to humans and animals. Natural paints derived from plant and mineral materials have subtle, soothing colors, pleasant scents, and help create a healthy environment. Natural paints avoid indoor air pollution and can have an unusual, attractive appearance. Creating durable, beautiful paints out of natural ingredients is not a new phenomenon. For millenia, people have been using the materials around them to create paints to color their worlds. Examples of natural paints can be found in the earliest cave drawings. They can be found in the world's most prestigious museums. And they can be found in the average home. Over time, synthetic, toxic and energy-intensive materials -- such as formaldehyde -- were added to the paints that people use in their homes. These materials weren't added specifically to cause harm, but that didn't lessen their harmful effects. Some of these materials include synthetic dyes to increase color choices, additives to combat mold, and non-water-based binders such as petroleum products and heavy metals which were designed to withstand high use areas like kitchens. A notable example is the lead-based paints that were once popular, but have now been linked to serious health risks. But interest in natural paints has recently resurfaced in the face of growing concern for our environment, bringing people back to the techniques and materials that have stood the test of time. Still, it is important to understand that "natural" doesn't automatically mean "non-toxic" or "safe." Please use the information on this page to help inform your decisions about which natural paints are best for you and your home. Below are examples of natural paints in action: beautiful, durable, and eco-groovy. A fresco from a house in the ancient Roman city of Herculaneum. Likely painted with chalk, charcoal and colored earth on damp lime plaster, this style of fresco did not require a binder in the paint to adhere to the wall. Madonna and Child by Duccio, 1284 A.D. This painting is tempera, an egg-based paint, and gold on wood. Tempera paintings are very long lasting, and examples from the first centuries AD still exist. Colin Campbell Cooper's Flatiron Building, 1908, is casein (milk-based paint) on canvas. 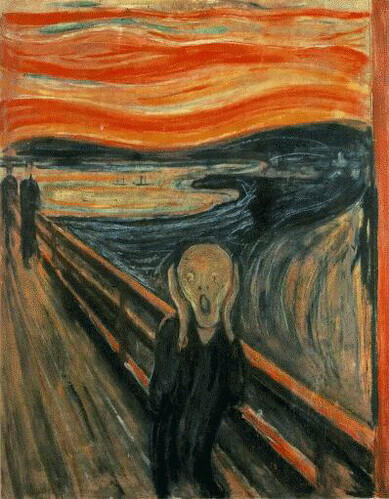 The Scream, or The Cry by Edvard Munch is casein, tempera and wax crayon on cardboard. This piece is created in the Nirmal style of painting. Named after a town in India, even modern Nirmal paintings remain true to the traditional techniques, including using natural ingredients like tamarind seed, herbs and mud. Flour paint can be applied to most interior surfaces, including this fireplace. Students at Humboldt State University use egg paint to create this logo for the interior wall of the Campus Center for Appropriate Technology. Natural earth pigments add color to natural paints and are available at artist supply stores. Paint generally has three main ingredients or parts. The first part is the pigment, which is responsible for the color of the paint. The second part is the solvent. The solvent keeps the paint in liquid form and evaporates off as the paint dries. Solvent can also be used during the painting process to clean paint spills and correct mistakes. The third part of paint is the binder, which, as its name suggests, binds the paint together. This is the main body of paint. A fourth, optional component of paint is a filler. Fillers can be used to manipulate the texture and consistency of paint, and to reinforce the binder. Volatile Organic Compounds, or VOCs, such as those found in synthetic household paints can cause physical irritation and/or damage including irritation of eyes, nose and throat, headaches, loss of coordination, nausea, liver, kidney and central nervous system damage and some are carcinogenic. Common organic pollutants (including VOCs) have been found in higher concentrations within the home than outside. Paints labeled "no-VOC" and "zero-VOC" can still legally contain up to 5g/L of VOCs. By volume, household paints account for a large portion of household hazardous waste in US homes. Although considered less detrimental to health and the environment than oil-based paints, latex paint contains hazardous ingredients such as acrylics, vinyls and epoxies. Oil-based paints commonly contain petrochemical products as a solvent. Until 1990, mercury was used as an ingredient in oil-based and latex household paints. Leftover oil-based and latex household paints from before then may contain mercury, and oil-based paints that are several years old may also contain lead. People with unused or leftover household paints that can be classified as hazardous waste are encouraged to donate, return or swap paint to reduce waste. Even in production, it is estimated that for every 1000 kilograms of synthetic paint produced, 10,000 kilograms of waste are created. For specialty paints, this can be as high as 30,000 kilograms of waste. Titanium dioxide is a key ingredient in synthetic paints, and must be mined and processed in environmentally damaging ways. Using natural paint can reduce the amount of VOCs present in the home, improving indoor air quality. Natural paints are microporous, allowing the walls to breathe. Because moisture is not trapped between the wall and the layer of paint, there is no blistering or peeling. Natural paints do not use petroleum products and contain ingredients from sustainable sources. Because of their non-toxic, natural ingredients, many natural paints are biodegradable, easily disposed of and even fit for a household compost pile once dried. This reduces landfill mass, environmental pollution and disposal costs compared to synthetic paints. Natural paints, especially store bought, may be more expensive than synthetic paints. Natural paints may be more difficult to work with than synthetic paints because of texture, rate of drying and inconsistent coloring from batch to batch. Although anecdotally durable and resistant, there is a lack of performance data on natural paints, so it is important to test natural paint before committing to a contract. Water-based paints are the best choices for an environmentally-friendly solvent[verification needed]. Distemper and lime wash are two popular examples. Casein paint is made from a protein commonly found in dairy, and is often called "milk paint" or "milk-based paint." This paint is mold resistant, durable and compostable. However, if not allowed to dry properly, milk-based paint can sour or mold. Egg-based paint is durable and quick to dry. It dries to a glossy finish. Flour paint, though thick and tough on brushes, can be used on a wide range of household surfaces including wallpaper and drywall. Commonly made from linseed oil, natural oil-based paints are durable and have a velvety texture. ↑ Photo courtesy of Heather Brown. ↑ Photo courtesy of Bill Steen. ↑ 12.0 12.1 This information according to CCAT natural paint project. ↑ This information according to Paula Baker-Laporte, Erica Elliot and John Banta, "Prescriptions for A Healthy House. A Practical guide for Architects, Builders & Homeowners." New Society Publishers, 2001. Page was last modified 04:38, 20 August 2012. Based on work by Appropedia anonymous user 91.182.172.104, Lonny Grafman, Chris Waterguy and Meghan Heintz, Appropedia anonymous user 142.22.16.51 and others.